John Carmack says Quake Live, the free, browser-based online FPS based on Quake 3 Arena, is unsustainable in its current format and will be adding a pay-to-use "premium" service model. 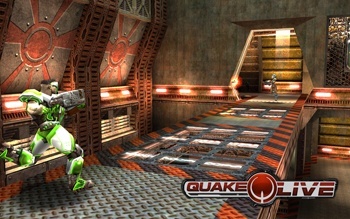 Quake Live offers the fast-paced online combat of Quake 3 Arena, including game modes like Team Deathmatch and Capture the Flag, but is entirely browser-based. After it entered open beta in February, id mastermind John Carmack said that while most of id's current games have to accommodate consoles, Quake Live "is an opportunity to do something where the PC will really stand alone." Unfortunately, the game apparently isn't quite as good at generating revenue as it is at letting people shoot each other in the face. Speaking at Quakecon, Carmack assured the audience that the game isn't a failure, nor is it in danger of being closed down, but said it isn't sustainable on ad revenues alone and will therefore require some kind of subcription-based premium service level. He didn't reveal any specifics about the plan but cheapskates in the crowd need not worry; he also said the game would probably always maintain some form of free service as well. I played around with Quake Live for several days after the open beta started and found it to be remarkably true to the original Quake 3 Arena. Having a full-blown, "instant on" multiplayer shooter built into a browser is pretty cool and the game looks pretty damn good for being ten years old. But with the good comes the bad: Quake 3 Arena was always kind of half-assed, wasn't it? Still, if you haven't played it yet it's well worth trying, especially while it's still free. kinda kills the purpose, at this point you might as well go hunting for a copy of Ultimate Quake. How was Q3 Arena half assed? It was one of the fastest, most frantic multiplayer experiences ever! I'm currently loving QuakeLive and this news is pretty sucky. Hopefully, this will all occur in the form of additional content and accessibility for premium players, and not cutting down what is currently available for skinflints like myself. Seriously though...the question is...is the game good enough to actually pay money for? Played it a bit but i don't have ADD so I haven't touched it in a while so I don't think I will pay to play it. I suppose that just means the old Q3 players will go back to playing VQ3 and the new players will start paying id Software. That's fine with me. This is really unfortunate, because the reason I enjoyed Quake Live is that for the first time in history I could actually attain a positive k/d ratio in a Quake game, which just feels fantastic.